Jackie Stewart won his 26th Grand Prix by taking victory in the Dutch Grand Prix at Zandvoort, in a race overshadowed by tragedy when young British driver Roger Williamson lost his life in a horrendous accident. A tyre problem had caused him to crash and the March came to rest upside down and on fire at the side of the track. 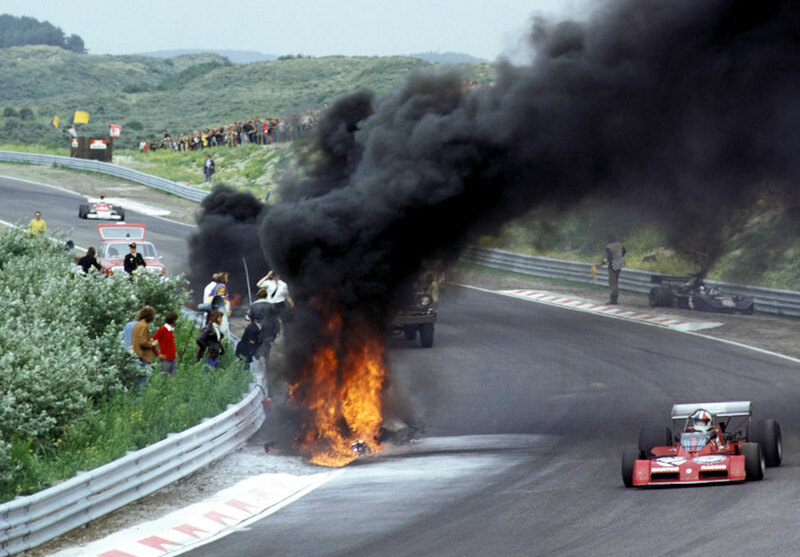 The trapped Williamson was unable to free himself but the marshals inexplicably did nothing despite the track being obscured by smoke and covered with debris. Fellow driver David Purley stopped his car and ran to his friend's aid, and tried to right the blazing car by himself. Sadly, his efforts were in vain and Williamson perished. Purley was awarded the George medal for his bravery but he remained bitter that marshals had not done more to help save his friend and criticised the fire-fighting services at the scene. Amazingly the race continued and Ronnie Peterson's Lotus led the Tyrrells of Jackie Stewart and Francois Cevert but gearbox problems dropped him behind the team-mates. As Stewart drove on to win, James Hunt brought his March up to third and Peterson retired once more. After the unspeakable fate of Williamson, the result seemed unimportant.